What dreams have God poured into your heart? What do you know that you need to step out in faith and do. Pray and ask the Lord. Seek His face. Listen. Prayer is a dialogue not a monologue. Then DO what He tells you to do. Ask the Lord for the vision and His wisdom to achieve the dream He has placed in your heart. We don’t have because we do not ask. James 4:2 Listen and write the vision down. Seek the Lord through His Word and prayer. Seek help from wise mentors and others. Keep a seeking attitude as you continue to pray. 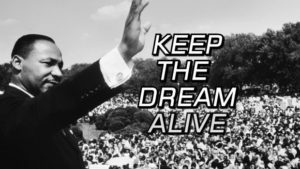 Keep the dream -the goal- the mission alive. When we allow God to close doors from our past, we enable Him to open doors which provide us with our New Beginnings! 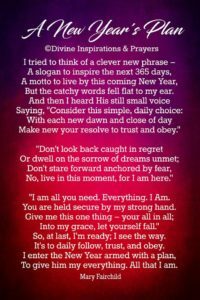 This New Year, 2018, is a year, which brings about the opportunity for beginning anew; it opens a new day and provides a chance for each one of us to collect ourselves and redirect ourselves. We now have the privilege of allowing God to close one chapter in our lives, as He opens yet another. However, we must understand that this is a two-fold process. When we allow God to close and open chapters in our lives, we must also allow Him to reveal to us what He has already perfected in us, as well as what He desires to perfect in the new chapter. In other words, He has to show us our progression from the past so we can see where we faltered, where we missed it, and where we prevailed. It is important that we learn how God has guided us and intervened for us in the past, so that we are more familiar with the methods He chooses to direct our present and future paths. He is the only one who can direct us to New Beginnings, because, it is He who has ordered our footsteps (Psalms 37:23). Moving ahead to a New Beginning, means recognizing and forgoing what impeded us in the past. We need to be able to identify the areas in which we met with obstacles, traps and stumbling blocks so that we can overcome them in the New Year. An obstacle is a hurdle which challenges us to overcome it, go around it, or remain stymied and perplexed before it…and we cannot move forward! A trap is a snare, which closes in on us, then grips, entangles and immobilizes us…and we cannot move forward! 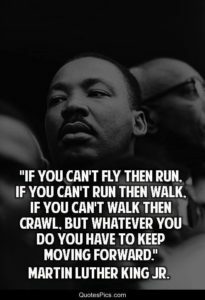 A stumbling block (in this respect) is something placed in our way to trip us, cause us to fall, or lose our footing…and we cannot move forward! We cannot move forward towards that which is new, because we are stagnated in that which is old—our past holds our present hostage, and we cannot move beyond either to our future. We, in and of ourselves cannot find the way, but in our opening text God declares, “I will make a way in the wilderness, and rivers in the desert” (Isaiah 43:19). Wilderness is symbolic of desolation, wandering and testing; and desert symbolizes hopelessness and an inability to produce fruit—God is telling us, that He will make a way through all that ‘stuff’ to bring us to a New Beginning. Not only will God make a way, He will show us the road map, and lead us through it; all we have to do is say “Yes I will follow You Lord, I will keep moving forward as You lead me into a New Beginning! New Beginning means we get a ‘do over’ for the things we did not quite master; for the things we were afraid to attempt because of lack of confidence and doubt, and the things we just missed altogether or failed to complete. God says that which impeded you will be no more, And He who was seated on the throne said “Behold I am making all things new” (Revelation 21:5). He gives us the opportunity to boldly declare ‘The past is over!’ We have the privilege and the power to embrace this “New thing” which the Father is doing in our lives. The year 2017 and all of its impediments, disappointments and setbacks is behind us now. It is finished, the Lord, God JEHOVAH says “Behold, I will do a new thing; now it shall spring forth” (Isaiah 43:19). Let us all move ahead, and spring forth to our ‘New Beginning’ in the year 2018. Evangelist Rose Watson is a native of New Orleans, Louisiana now residing in San Antonio, Texas where she serves as Church Administrator and Prayer Ministry Leader at Victorious Kingdom Living Christian Church. Rose is a writer who has written curriculum for Sunday school and Vacation Bible School as well as short plays and skits for Christian Education and Evangelism. You can contact her at rellen.watson@gmail.com, or rosewatson@ministers.com. 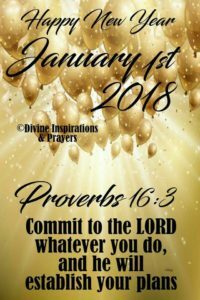 On this Marvelous Manifestation Monday 2018- As you walk in this New Year on this Marvelous Manifestation Monday the first Monday of 2018 do so with great expectation of new beginnings, new opportunities, blessings , favor, renewal and victory. Know that God is going to do great things through you. May God grant you your heart’s desire and fulfill all your plans that line up with His will for you and may we shout for joy over your victory. ( Ps 20:6 RSV). Praise God for His unfamthonable love for you!! Praise Him for daily loading you up with benefits. This is the year of victory and favor for you. Praise Him for the fact that you are still here and looking forward to GREATER in 2018. God is amazing and can “ fix it”, bring you through ,will never leave you ,will help see you through and He listens and answers prayer. Believe and obey His Word. Pray without ceasing. 1 Thessalonians 5:17. Keep praying, pressing forth and pursuing the dreams God has placed in your heart. Don’t be afraid to shine with love and the spirit of excellence. On this Marvelous Manifestation Monday, praise God for His unfamthonable love for you! What is your expectation for this week, month , and year? Think Big, Do Big and Think Victory! Praise Him for daily loading you up with benefits. This is the year of victory for you. Praise Him for the fact that you are still here and looking forward to GREATER in 2018!! Even if things are not what you want for now, shout for joy with Praise now, because you have a God that can “work it out” by working all things –good ,bad and ugly together for your good (Rom. 8:28-30) if you believe.